I am becoming quite nostalgic while working on my "52 Church PotLuck Dishes". Almost daily I am pondering recipes, new ones of course, but also reminded of the dishes that I always gravitated to in the heyday of my youth. Back in that little Baptist church in the middle of a cornfield in the middle of Illinois in the middle of the last century, a PotLuck meal was arranged about once a month. Depending on weddings, funerals and work days sometimes more often. The seemingly endless bounty was a joy to behold and remember. I will confess to being a bit of a picky eater back then. But like all pre-teen boys, I loved them tater tots! I would put up with a lot of questionable extras just to get a taste of that top crusty crunchy tot covering. Chicken, Tomato Sauce (home made whenever possible), Mozzarella Cheese Parmesan Cheese and breading (OK, the Tots are counting as breading... Everything that makes a Chicken parmesan, all wrapped up in a casserole dish. I then took a look around my pantry and started adding vegetables like my Sainted Mother would have... Onions and peppers, corn even a couple of fresh diced tomatoes. But, those veggies were the price an 8 year old Baptist boy was willing to pay for a Tater Tot Casserole. In a large saute pan over medium heat, melt the Butter. Add the Peppers and Onions to the butter and saute until soft and the onions turn opaque, about 5 minutes. Bake in preheated oven for 50 to 60 minutes until the tots are golden brown and starting to char! Garnish with additional Mozzarella cheese, sauce and Parmesan Cheese. I have done a few posts on making Italian Gravy (Marinara Sauce). One I am very proud of was my post for Herbed Tomato Sauce for Pasta back in January. This post is very similar, EXCEPT this recipe calls for fresh seasonal ripe LOCALLY GROWN tomatoes. In January when fresh tomatoes are trucked in from thousand(s???) of miles away, the freshest tasting tomatoes are always canned. That January recipe is very very good and uses those big cans of tomatoes to make a very good tasting sauce. This recipe is seasonal. Only about 2-3 months of the year can you find those fresh locally grown, picked within a few days (sometimes hours or if you grow your own... MINUTES!!!) tomatoes that have such a rich taste. This does take a longer prep time (the "Canned" version is a 20 minute hands on recipe), but not that much longer. It took me about an hour to cut and prep 5 pounds of tomatoes. For that effort I came away with 4 quarts of pizza sauce that is the best I have ever made... or had. Nothing like fresh locally grown tomatoes. I do have one tip that will save you lots of time. Many recipes will call for the tomatoes to be peeled. This indeed is necessary when you are dealing with imported out of season tomatoes. the miracle of engineered fruit have designed many types to be thicker skinned. But summer tomatoes, picked locally, generally have thinner skins. This combined with the cooking process that includes a spin of a hand wand blender (or food processor), leaving a smooth sauce, makes this step unnecessary. But first, in a large Saute pan or skillet, heat the Olive Oil over medium heat. When hot and just starting to smoke, add Onions and peppers and saute for about 6 minutes, stirring occasionally until the onions begin to turn translucent. After 5 minutes, add the garlic and continue to cook for ONLY 1 minute more to release the garlic oils. Carefully wash the tomatoes to remove any dirt or possible pesticides. Cut into quarters or even smaller pieces if you are using large tomatoes. Remove the hard center top core. Stir in the Balsamic Vinegar and stir to mix everything. Add the spices, stir one more time, close the lid and leave the cooker closed for 8 hours. After 8 hours, open the lid and use a hand blender to puree the sauce. If you do not have a hand blender you can puree in batches in a blender or food processor. Taste the sauce and add more salt or pepper if needed. Be careful to not over salt as this sauce will may be used to season already salted food. Better too little than too much. Return to the slow cooker, set it on high uncovered and check every fifteen minutes for the degree of thickness you want the sauce. Serve over pasta, as a pizza sauce, or cooking sauce. and ENJOY! First, this is an ANGRY post... I was ANGRY when I decided to make this. We do not eat out very often. Several reasons, the cost is certainly one, BUT once I make the decision to go out to eat, I do like to enjoy myself and have good food that I generally do not make at home. Skip this paragraph if you like, I am going to rant... I was charged $12 for an appetizer of Spinach and Artichoke Dip. OK, not the same price I remember from 30 years ago, but what is. My complaint first arose when I was served about 1/4 cup of dip and 3 slices of bread from a baguette... about the size of an old silver dollar... tiny portion. But that wasn't the real insult. the dip was thin and watery, had very very small amounts of spinach and artichoke. I was basically delivered hot sour cream with specks of flavoring. In fairness to the restaurant and the server, I did politely express my disappointment and was refunded the cost, but honestly... COME ON, Are You Kidding Me??? OK, rant over, but I started craving the dip of my youth. It weighed heavy on my mind and I knew I could find a recipe that would work as well (better) than my memories. Indeed, this tasted beyond perfect. thick, chunky with Artichokes and Spinach, Creamy, Cheesy, Salty and delicious... But LOADED with calories. All in all, this could be the most fattening thing I have made in a very long time. It does make about 4 cups of dip. So plan for a party, have several friends over or go crazy and over indulge one night. Either way, I am addicted to this WONDERFUL Full Flavor delight! And, this is VERY VERY easy to do. basically just melt, stir and mix. Not much to go wrong so I am adding this to my list of dishes that are simple to make but are spectacular to serve and dress up your table... Delicious, Easy and Spectacularly Memorable! In a medium pot over medium heat, melt together cream cheese, sour cream, butter and parmesan cheese, stirring frequently until melted and an even consistency. It should start to bubble. Stir in coarsely chopped artichoke hearts, jalapenos and Squeezed spinach Finally, stir in minced garlic cloves. Serve HOT with chips, crackers or bread and ENJOY! And a unique taste twist on candied nuts. You end up making a beer caramel sauce (which was delicious on it's own... wanting to try this on ice cram soon... But I digress). You start making a Beer Simple Syrup, equal parts sugar and beer. But, as you heat this mix to a candy temperature of 250 degrees, the mix begins to turn. from a liquid to a thick syrup. It looks difficult, but really simple. Just keep stirring over heat until the thick syrup forms. The beer taste stays in the candy nuts. As always, when you cook with beer, the actual alcohol cooks out, just leaving the flavor. Always chose a full of flavor beer, something with plenty of taste. I chose a local (to me) Kansas City Boulevard Brewing Company's Amber Ale. The Amber Ale already has a sweet nutty taste from the English specialty malts and German hops. Made a fantastic combination, perfect for the nuts. Pre-heat oven to 325 degrees, Line a baking sheet with aluminum foil. Combine Chili Powder, Olive Oil, Cumin and Pepper in a small bowl and thoroughly mix. Add the nuts and stir to coat. Spread nuts on foil lined baking sheet, single layer and toast in the oven for 10 minutes, until fragrant. Meanwhile, in a heavy bottomed sauce pan combine 3/4 cups Beer with 3/4 cups Sugar. Heat over medium high heat until mixture registers 250 degrees on a candy thermometer, Stir continuously. As the mix heats it will take on a thicker almost a thin caramel texture. As it reaches 250 degrees it will become even thicker where it barely will pour from a spoon. Remove from heat and carefully add the nuts while continuously stirring. Spread the now sugared nuts on foil covered baking sheet, separating clumps. Let Cool Completely, break up any large pieces and serve with a cold beer... And ENJOY!!! 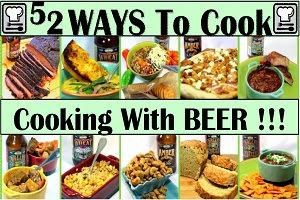 So, I am pleased to list this as one of my Growing list of "52 Cooking With BEER Recipes"!!! This is my very favorite way to prepare fish! 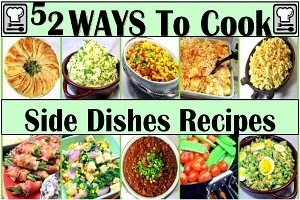 It is also just about the simplest way to cook ever. The fish is actually poached in HOT seasoned Butter. The seasoning is called Blackening seasoning of you look for it in the grocery store. But any Cajun spice mix will work as well (with slightly different tastes). The black term comes from the spices actually charing, turning to a black pepper, making those pepper spices POP. This post is more of a cooking technique than a recipe post. 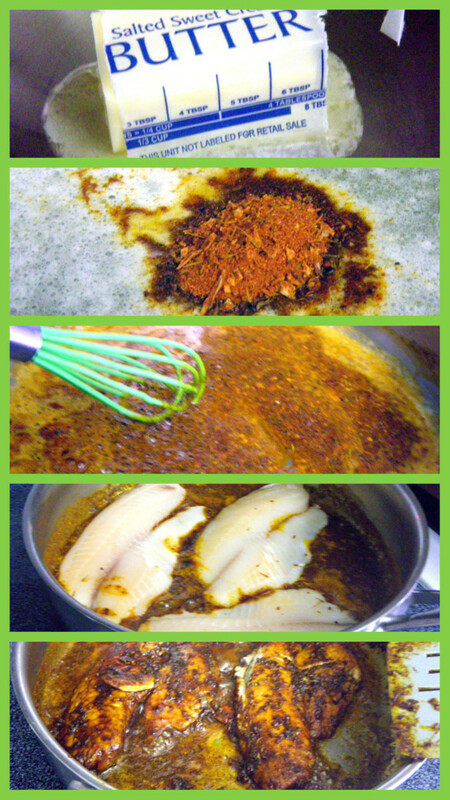 All you need is butter, a Cajun spice mix and a piece of thin fish (like Tilapia). I am a huge fan of New Orleans, New Orleans cooking, Cajun and Creole and all things Big Easy. There are plenty of pre-mixed store bought Cajun spices. Paul Prudhomme makes one of the best that is available at most grocery stores. If you only make Cajun cooking a few times a year, buying a tube of his spice mix once a year will work fine for you. Me, I like to mix my own spices. It is cheaper and I get to control the amount of salt and heat. I call my mix, "Big Easy in a Jar". You can find the formula for the mix by clicking the blue letters or the photo to the right. Melt the butter in a heavy bottomed skillet over medium high heat..
Add the spice mix and stir to combine. Continue to heat the butter/spices until the mix just starts to smoke. This is the only real tricky part as you want the spices cooking, but you do not want them to burn. Once they start to gently smoke, add the fish fillets and turn the heat down to medium. Cook for another 2 minutes and the fish is done! Tarter Sauce is one of those condiments you usually have in your fridge, but who can remember how old that jar is? So, a few years ago I decided to toss that jar and simply make my own whenever I have fish. 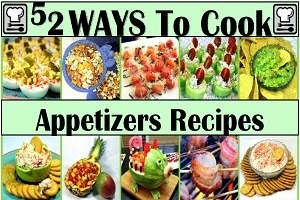 It is of course VERY easy, but also you can add flavors as you wish to increase the flavors. In this recipe, I add pickles and a bit of the pickle juice in the jar. This is in place of the more common addition of vinegar. Just another way to add more flavor. As to the Cajun Spice Mix, of course just about any Store bought mix works fine. I happen to have an excellent mix recipe that I make often. Something I always have around my house, my "Big Easy in a Jar" New Orleans Cajun Style mix. Get even MORE bragging rights and make your own! I really LOVE a good potato Salad! There are hundreds of vastly different recipes (I seem to try a different one about every other week). But probably the most popular is the basic Yellow Mustard Tater Salad. Well, this is a bit of a different take on the traditional. With a strong hint of the vinegar pickle brine, and the sweet sugar added to that brine to make Bread and Butter pickles, this salad has the look of traditional with a little extra somethin' somethin' added. There are also plenty of extra vegetables to add even more somethin' somethin' (like peppers, onions and celery). Now, optionally, I added some minced Jalapeno. Only a couple (5 pounds of potatoes vrs. only 2 jalapenos). It certainly added some heat to the mix. These are of course optional. Know your audience. If you are indeed cooking for a church, you may want to be careful with the "heat" and make this more crowd friendly. Of course if you know that hot and spicy is what they want, go ahead and add the jalapenos, plus feel free to add a few drops of Tabasco sauce! Like I said, this is one of my favorites, one of the tastiest of all my Potato Salads... guaranteed to be a HIT! Boil sliced potatoes for about 15 minutes until cooked through and tender. Leave the skin on for flavor, texture, presentation and of course health reasons. Meanwhile, boil Eggs until hard boiled, start with a pan of cold water, add eggs, move to high heat and bring to boil. Cook total time from cold water to rapid boil, 15 minutes. Peel eggs and chop. Stir together mayonnaise and remaining ingredients (except Garnish. Gently stir Mustard mix and eggs into potatoes. Sprinkle with Salad Sprinkles or Paprika and refrigerate. Refrigerate for several hours allowing all the flavors to mix and mingle. I actually made this twice this week. First time to make sure it was as good as it sounded, served up at a back yard BBQ for a couple of my neighbors. Second time was for an actual Church PotLuck meal. Both times the dish was very popular!